The United Nations says Secretary-General Ban Ki-moon stands by every word of his criticism of Israeli settlement-building this week and rejects Prime Minister Benjamin Netanyahu’s comment that the remarks justify terrorism…. The UN chief, who is in the final year of his term, also said that “you can count on me to speak up” to help achieve an Israeli-Palestinian peace. Prime Minister Benjamin Netanyahu didn’t like U.N. Secretary-General Ban Ki-moon’s speech to the Security Council criticizing the Israeli occupation on Tuesday. Carlos Latuff is a political cartoonist from Brazil. Other posts by Carlos Latuff. Ban wants us to understand human nature; and The Yahoo provides a Trumpesque example. i love this cartoon, latuff is brilliant. and this is netanyahu’s excuse for everything. deflect responsibility w/the charge of incitement. Netanyahu is wrong as usual, it is not Ban ki-Moon that is inciting any violence, it is Netanyahu and his policies of violence, land grabs, and an endless occupation. It is more than enough to make anyone want to pick up a stone and hurl it at the oppressors. kay, see the update.. ban ki moon completely rejected netanyahu’s criticism. 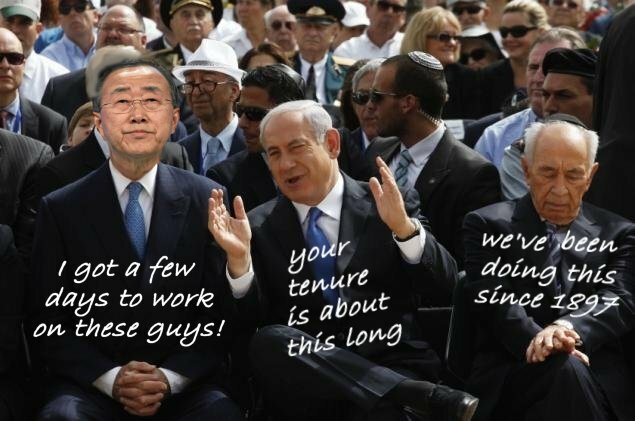 I hope Ban Ki-Moon and the UN stand up to Netanyahu and his scare tactics. It would be great if Ban Ki-Moon said “let’s stop the posturing, and address the shameless announcement of more condemned illegal settlements, which you seem to avoid”. It is Ban’Ki-Moon’s last year he has nothing to lose. Annie: land grabs not only incite violence, they are achieved by application of violence. There would be no occupation and no settlements without an IDF sitting by with weapons at the ready to enforce Israeli decisions and Israeli expropriations of land. The occupation is the war after the war. The war itself lasted 6 days, The occupation has been an armed example of warfare that lasted about 50 years (so far). What 7 days are you talking about? The war and official occupation were started 68 years and 2 months ago, in November 1947 to be precise, and never relented. The continuous regurgitation by so many on this discussion board of the colonial powers’ illegal establishment of a racist invader kingdom with no justification, other than that it was imposed by the colonial powers, is a perfect example of how general brainwashing by simple contact with the ambient culture can be. …unless, of course, it benefits Zio-supremacists and the religion-supremacist “Jewish State” of Israel. Like all Zio-supremacists, Bibi is a hateful and immoral human being and a hypocrite. Hmmm this is strange. My comment on the drawing was posted here a while ago, but now its gone. A case of retroactive moderation perhaps? Or even act of censorship and denial of free speech? Why is left-wing, progressive JVP affiliated with a site that appears to practice fascism in its operation? I’d appreciate it if any of the admins can look into the matter and let me know, thank you. ” Or even act of censorship and denial of free speech? I’m sorry, but I don’t know of anything that gives anybody the prior right-to-publish when they send a comment to a blog. Do you? A comment is exactly like an unsolicited letter-to-the-editor in a newspaper. They don’t have to publish it. What happened to you is “moderation”. It is not “censorship”. Don’t even try to go that “censorship” route, it’s absurd. And gee, didn’t you, maybe more than once, say it didn’t matter to you if your comments were deleted? Of course the deletion of some comments while others remain is censorship. @Mooser, so are you saying you are free to delete or allow comments to show as you please? You can’t compare the comment section of a webpage ( a progressive one at that) with letters to a newspaper. The latter is extremely space limited, while web comments take up almost zero server space. Also, deleting comments in a discriminatory fashion is censorship in my opinion. Comment section is meant to allow readers to gain perspective from various angles that articles alone won’t provide. But if you simply delete or approve comments to your liking, then there is no point of having a comment section because it will be another medium for you and other admins to further their propaganda while at the same time appear to be fair and impartial to the unsuspecting reader. The reader would just see the ‘good’ comments and be subconsciously implanted with the same bias and perspective of the admins, totally oblivious to the against the grain comments which were deleted before the reader can see them. rugal b. try posting it again down thread. yes, it was a case of retrograde moderation. please consider, when posting comments or critiques, that do not directly relate to content of the article that they are more likely to be construed as threadjacking, a form of trolling/spamming (see comment policy rule #6) if they are the top comment in the thread. keep this in mind for future posts. i thought suggesting latuff produced “more weak stuff” for (allegedly) evading white supremacy was a potential threadjack. so try starting that conversation downthread, not in a rebuttal to me here. it’s possible when the comment was originally cleared the moderator didn’t notice it was the top comment as we generally moderate on a back page of the site, not the way they appear in order here. Or even act of censorship and denial of free speech? 6. No trolling. Wikipedia defines trolling as “someone who posts inflammatory, extraneous, or off-topic messages in an online community, such as an online discussion forum, chat room, or blog, with the primary intent of provoking other users into a desired emotional response.” That definition is good enough for us. We hope our comment section can feature an engaged and free flowing debate, but we are not interested in commenters whose only aim is to disrupt or sabotage the discussion. just because one may think the topic of white supremacy, and ones opinions regarding them, are appropriate in every thread, doesn’t mean one has a “right” to express them here (in every conversation) especially not, for example, in top comment OR in the middle of a ongoing conversation about something else. also, we don’t generally host extensive conversations in the comment section about moderation rules (unlike sites like daily kos). and we don’t debate the merits of our decisions online (iow, if you try debating this with me here — it will likely get deleted). i hope that facilitates your query. try posting your critique on the breadth of latuff’s work downthread. and if you’d like latuff to make cartoons about white supremacy, tweet him and ask. he is very responsive. also, i should mention — we added the text of the article. i wrote one line and phil or adam added the blockquote for people who had not been following the story. latuff is a cartoonist and as far as i know doesn’t write articles. My impression of Ban Ki-moon up to now was of he being a puppet-on-strings, without any backbone and cojones, perhaps he will be allowed now to defende himself, if he can muster up enough courage. Still, we need a SG of the UN to be a person with great diplomatic background, (what Ki-moon doesn´t have), to be forceful, (Ki-moon has even less of that quality), and be independent of the USA, (in that case someone must cut the strings he is dancing on)! Anyone knows the right person? *At the same time, the Palestinians announced that they are relaunching their efforts in the UN Security Council to try and overcome the current diplomatic impasse. The first step will involve pushing for a resolution against Israeli setlements, according to a statement that Palestinian Ambassador to the UN Riyad Mansour delivered on Friday. ONLY HAARETZ IS REPORTING ISRAELI REJECTION OF FRANCES OFFER!!! ‘Israel rejected Friday evening the new peace initiative by French Foreign Minister Laurent Fabius. A senior Israeli official said that Fabius’ threat to recognize a Palestinian state should the talks reach a dead-end effectively incentivizes the Palestinians to try to see the talks end in deadlock. “This [leaves] no way to negotiate or to reach peace,” the senior officials said. JPOST is now reporting an ‘Israeli diplomatic official’ rejecting the French proposal – DEAD ON ARRIVAL!!! Beautiful, Israel, Beautiful — you made sure it was DOA before it ever got off them ground. How utterly STUPID of you!!! How about an UN Sec Co Resolution supported (abstention) by the US on MONDAY MORNING you fools! “We see that unfortunately colonization continues and that recently, the Israeli prime minister went so far as to reproach the UN secretary-general for encouraging terrorism on the basis that he had reminded of colonization’s illegality and asked that it cease,” Fabius said. A diplomatic source in Jerusalem told The Jerusalem Post’s Hebrew-language sister publication Ma’ariv that Paris is essentially encouraging Palestinian intransigence by signaling its willingness to recognize statehood, thus prejudicing the outcome of negotiations. It seems Aaron Miller thinks this proposal is “bone headed”. “The move would have no practical effect on Palestinian or Israeli lives, but it would have symbolic impact and increase diplomatic pressure on Israel, said Aaron David Miller, a former State Department peace negotiator who has advised several U.S. presidents on the Middle East. “The French carry serious weight in the international community,” said Miller, who called the proposal “bone headed” on Twitter. Now why can’t French leaders be intelligent like Miller, and wait for Israel to extract all the land their greedy hearts desire, and then claim there are no Palestinians there to negotiate with? Then all the land and water will be Israel’s. Miller’s loyalties show and it stinks. If Netanyahu really believes the UN has lost it’s moral force he should perhaps boycott the organisation, withdraw Israeli funding from it, and sanction its members. I wonder exactly what Netan’yahooo thinks is Israel’s posture to be regarding the Palestinians if not as an oppressive occupier? Does he see Israel as a benevolent guardian, while it systematically gobbles up Palestinian land for what are illegal settlements? If Netan’yahooo is going to criticize Ban Moon for telling the truth, he should stand ready to refute that truth; the world has been and is patiently waiting for the Prime Minister’s version of these systematic land thefts in search of Greater Israel. Elizabeth, everyone in the world has anti-Semitic DNA, except for Jews. If you convert to Judaism, your DNA changes. Wrong! If that was so, how do you account for “self haters”, kapos and mosers? Please see “Hophmi’s” comment archive for precise clinical descriptions, statistical enumerations (with the usual 0.00% margin-of-error) and case histories. I think that it may depend upon who oversees the conversion. Israel (I think) only recognizes Orthodox conversions. Americans who convert may find that Israeli religious Jews feel that their DNA has only been reformed, not converted. I’m not sure about that, I never got involved with genetics. Perhaps if the Americans changed their name to Cohen that would do the trick? Or at least extra credit for effort? I certainly hope these comments on DNA ment to be jokes!! Jews are not born, they are made, exactly as moslems, catholics or any other religious groups. Take a jewish child after birth away, before the rabbi goes to work on him, and give it to a catholic family, or a moslem one, and that child grows up to be a pope follower or prays facing toward Mecca. How many jews will never know who their real father is, the same goes for any member of the human society. Now, there’s a banner under which to unite humanity! Even if nutty was speaking the truth he neglects to mention Israel murders for land and supremacy and not for peace. While that is true nutty is still lying. Who can forget danny ayalon’s smirking tweet that the threat of peace is off the table. No of course not. They can beat their chests, breathe fire at anyone who dares to criticize, and even wail about anti-semitism, but they simply do not refer to the fact that their master plan does not include peace with those they steal from, occupy, and massacre in large numbers. These zionists are such deceitful people. The last nine words are the most significant, imho. Oh really? Funny you never got the courage to make even an anodyne statement like this until you were on the way out. Typical. All these politicians suddenly develop a conscience when they’re (almost) out of office. Ignoring all his other shortcomings for a moment, isn’t Ban- KiMoon the only person to make these kinds of criticisms and/or dire warnings while still in office? Pretty remarkable if only for that. Edit: Hi MDM. I can’t remember anyone ever doing it while still in office – “almost” or otherwise. Maybe I’m wrong about that. Obama’s fed-up yet tepid criticism and now this stark and unrepentant criticism both signal some kind of background shift to me. Thanks for all that interesting information. This would be the ideal time for France to lead the rest of the world, and push for justice for all the Palestinians under occupation, and in refugee camps. They have suffered for decades. The longest occupation in our time MUST end. Israel has hoodwinked the entire world, manipulated it, and controlled it with threats and cries of victimhood. Enough. If they keep criticizing colonization like this, French FM may be found afoul of French anti-semitism laws along with Ban Ki Moon. It would be interesting to see them taken to court over that. i was thinking the same thing myself for-peace. Life for jews in France cannot be very bad, after all that country has the largest jewish population in Europe. They should look how their semitic brothers, the arabs, are threated and under what conditions they live. Talking about colonisation, the question might come up what France is doing in Mali, Ivorycoast and other former french colonies in Africa? They even got NATO and EU military help to make sure the uran from Mali keeps coming to the many nuclear plants in France. I wonder if Ban Ki Moon and the French have been saying such stuff because they were encouraged to do so by the Obama administration. i’ve had this very same hunch lysias.